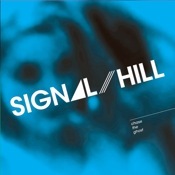 From its first shiny post-rock guitar note, Signal Hill’s Chase the Ghost gets busy bringing the feel-good. This disc has been living in my car’s CD player since I got it, and has provided the soundtrack to many go-nowhere summer drives. It lands in your ears with its blend of effective hooks, shoegaze overtones, and laid-back attitude. Every song here could fall into two categories: background music for a scene that hasn’t been filmed yet, or catchy song in search of meaningful lyrics. Dave Masters and Rishi Arora switch off up-front guitar duties, both bringing a similar, thoughtful style, making a real cohesion of sound. And when they play off one another, the chemistry of their years playing together comes through. The title track, which closes the disc, is a great example. Very quiet and personal, rising to a cathartic (yet still cool) climax. It’s like listening in on a pleasant-yet-intimate conversation. Brian Vasallo and Tim Cooper, on bass and drums respectively, hold down the rhythm section across these nine tracks. Cooper is a steady, understated presence, even when he’s given a little break of his own on “The Fantastic Hours.” There’s some interesting production hiding amid all the nearly radio-friendly tracks here. Field recordings of children bridge the space between the chill groove of “Pacific Northeast” and “Imaginary Friend #2,” a beautiful slow piece which also has some tasty vibraphone from Dave MacEwan and violin from Samantha Rawlings. Let’s be upfront here: those who don’t enjoy slightly upbeat, guitar-driven, indie-style tunes probably need not apply. And there is some sameness to the sound, with the abundance of crisp, high, strummed chords and slow-handed melodies, but it’s so pleasant and positive that it’s easy to overlook. Plus, it’s killer in a mix. A very good listen.